Leopard Lanyards: Cool Leopard Print Lanyards, Rosette Coat Patterns Printed Lanyards. Leopard lanyards are pre-printed lanyards with attractive rosette coat patterns. The leopard rosette coat patterns are printed with dye-sublimated colors on both sides of the lanyard. Standard leopard print lanyards come with heavy duty nickel color swivel hooks, badge clips, key rings, or cell phone connectors. Leopard print lanyards also come with a variety of optional hardware attachments, such as safety break-away buckles, heavy duty nickel color, gold, antique brass or black nickel color snap hooks. 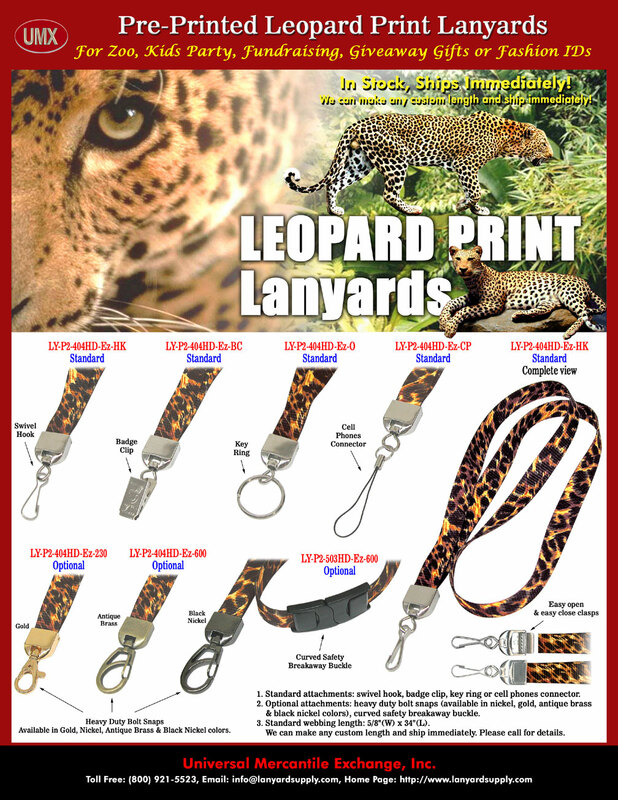 The big wild cat - leopard print lanyards are good for zoo's gift shop resale stores, kids party, outdoor adventures, school or church fundraising, promotional giveaway for events or conventions, as gifts, or as fashion name badges to wear. The leopard print lanyards with the cell phone attachment can be used to carry camera, cellular phone, USB flash memory cards, flash drives, CD, iPod or MP3 players, flash lights, small meters, and electronic devices etc. Please check our online catalogs for more cool lanyards with animal prints. The jungle wild cat - leopard is distinguished with its rosette-patterned coat and long, dark tail. The leopards are dispersed over a wider area today, than that of any of the other large cats. Leopards are spreading across most of the African continent, parts of Asia Minor and the Middle East to India, Pakistan, China, Siberia, southeast Asia, Java and Sri Lanka, etc. Leopard is one of the roaring cats, capable of producing a deep sawing roar similar to that of the jaguar. The leopard is also like the jaguar in coat pattern, with dark spots or rosettes. The leopard's rosettes are generally smaller and have no internal spots. The base coloration of the coat also varies greatly depending upon location, ranging from golden/yellow in open grasslands, through yellow/cream in desert areas to deep gold in mountain and forest regions. Our leopard print lanyards come with dark spots and golden/yellow color patterns. Specifications: Leopard Lanyards: Leopard Print Lanyards, Rosette Coat Patterns Printed Lanyards - Leopard Lanyard Stores or Gift Shops Supplies. 1. Standard Width of Leopard Lanyards: 5/8". 4. Standard Colors of Webbing/Straps: Leopard Prints. Optional: Any Pantone PMS colors with a minimum order of 5000 pieces or more. 7. Way of Pre-Printed Patterns: Dye sublimated on both sides with leopard prints. 8. Custom Imprinting: Use the leopard print patterns as back ground. Any customized or personalized logo printed on leopard lanyards available. Can be use as leopard print neck lanyards or leopard print wrist lanyards for ID name badges, dog leashes, tools holders and as shoulder straps for handbags, bags, or purses. You are viewing > Lanyards > Ez-Adjustable Neck Wear Models > Leopard Lanyard: Leopard Print Lanyard, Rosette Coat Pattern Printed Lanyard, Animal Print Lanyard Supplies.